After a hectic Wednesday of work, I had two options to help me unwind. Either hit up a happy hour or indulge in some really dark, gourmet chocolate —the sort of chocolate that you close your eyes to eat, so that you don’t miss a moment of sweet and earthy fulfillment. I chose to drop my chaotic email chains and overused brain at the door of Piece, Love & Chocolate, one of Boulder’s sweetest gems. 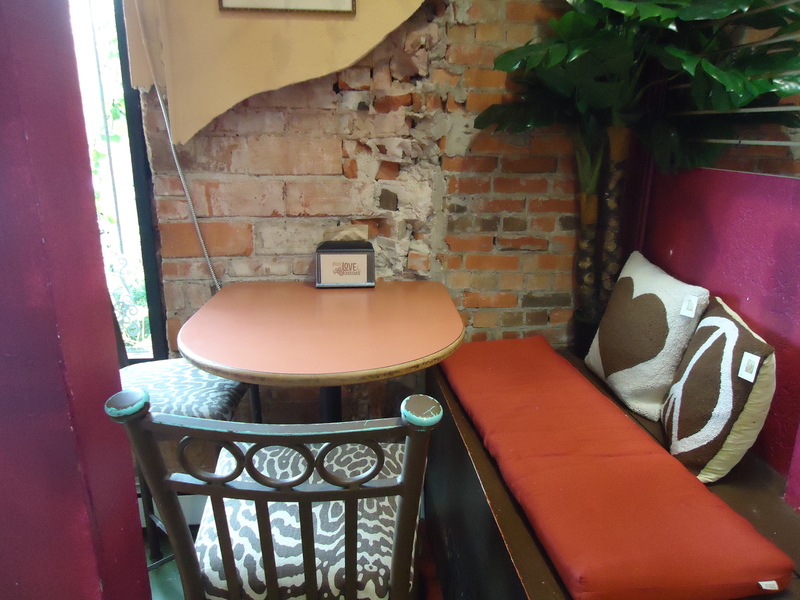 The cozy little shop tucked on the west side of Pearl is full of whimsy. In the middle of the shop, a tree installation hides a steel beam. Gnarly branches, leaves and vines drape from the ceiling over display cases while shiny heart charms, pods and parasols dangle from branches. Even the ceiling fan blades are shaped like giant leaves. Most of the colors are earthy ones and give the effect of a forest. But there is just enough red, pink and gold to make this particular forest vibe a whimsical one. I chatted with an employee named Dee who was full of information about the shop. 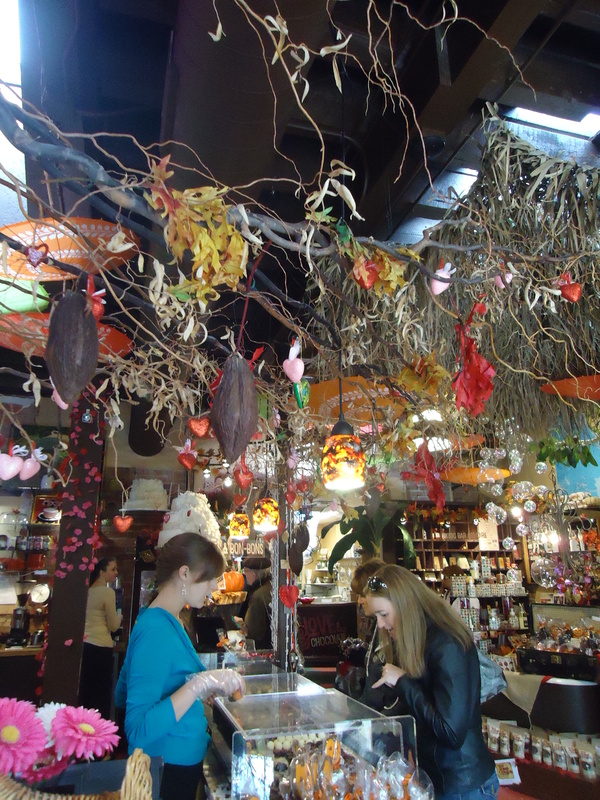 She explained that the owner did the décor herself and is a chocolatier. The shop is primarily filled with items made in the shop but also sells delicacies from other local chocolatiers. Much like the ambiance, the case of chocolate is like something out of a fairy tale. 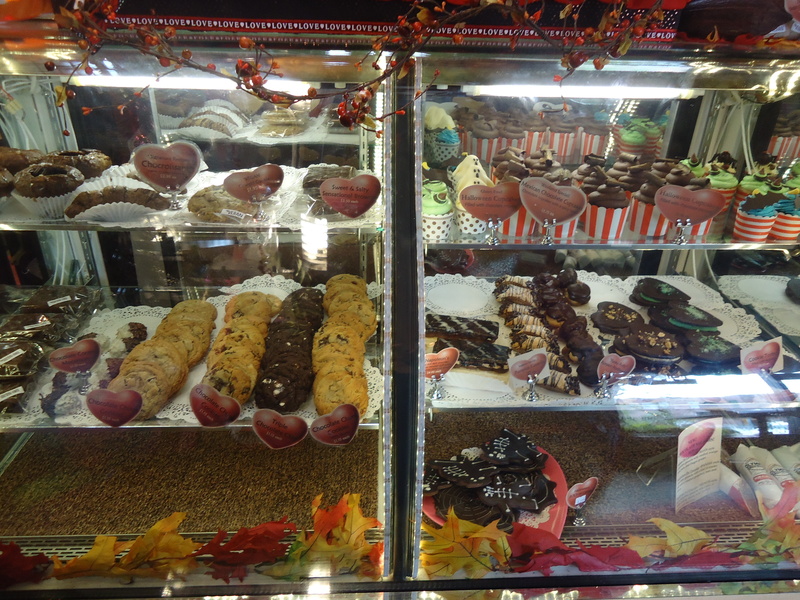 A section of the chocolate counter contains baked goods. From pumpkin cannoli to vegan and gluten-free cakes, any desires and all dietary restrictions seem to be covered. Dee said the shop is popular for the truffles. I can see why. Underneath the shiny glass, sit some of the most intricate and enticing truffles. Some are your ordinary balls of chocolate. Others are shaped like elephants or golden acorns. The salted caramel truffle is the most popular item the shop sells. I ordered five and they were put neatly in a box, cozy inside their individual paper wrappers. WARNING: when Dee tells you there is “liquid caramel” inside, she’s serious. Upon biting in to the sweet salty chocolate shell, caramel spilled out in my mouth, my hair, and the floor. Oops. So worth it though. The only problem is that I may have an addiction to $2 little pieces of salty, chocolate, creamy, sweet pieces of yum. The shop is popular for their drink bar. The hand written chalkboard menu is scribbled with unique chocolate drinks. White chocolate chai (made with Boulder’s very own Bhakti) and hot sipping chocolate all sounded good so I asked my Chocolate tour guide, Dee for her favorite. She whipped me up a cup of hot dark chocolate with a dash of roasted chili. If Dee represents customer service from Piece, Love & Chocolate employees, the shop is golden. This woman took some serious time to explain bits about the shop and the chocolate. She seemed so content and in her element offering a smile and casual conversation to everyone who walked in the door. Crossing my fingers that my sipping chocolate would soothe me like a martini, I took my first sip of steamy earthy goodness and realized I was consuming a liquid meal. Never have I ever had something so rich in my mouth. Since I was drinking the dark chocolate (you can also choose half and half or white chocolate), it wasn’t very sweet which fit me perfectly. The subtle sweet mixed with the bold earthiness of the dark chocolate was balanced out beautifully with the roasted chili. Other drink “toppers” include lavender, anise and orange. While cozy in my corner of chocolate and whimsy, I realized I had made an appropriate choice choosing chocolate over vodka. Plus, the “scene” is just relaxing at Piece, Love & Chocolate. Mothers and kids are frequenters as well as college students working on homework. In addition to truffles and cakes, the shop also sells chocolate memorabilia and offers classes. In the back of the store, the chocolate lab/kitchen is partially exposed and this is where they host some exotic chocolate classes from soufflé making to chocolate and beer pairing. Though I’m not trading in Boulder’s fabulous happy hour scene for chocolate every day, it’s nice to know that I can return to my corner of chocolate and whimsy whenever I need to relax. Great article! Sounds like a wonderful spot to check out next time we visit Boulder!